Writs R Wrought: Wow! What a week! First off, and most exciting, my book A Heart Full of Diamonds has finally been published in print and ebook! Some of my fans have been waiting ten years for this event, so I'm understandably excited. I love the new cover, too. It's been a lot of fun learning to make my own covers, and with this one, I'm feeling confident that I finally know what I'm doing. What's this one about? Here's what's on the back cover. Once she saw the diamonds, she was out of options. A wig, a change of clothes, and nerves of steel freed Marilee from her diamond-stealing husband, but Tony has too many friends in too many places for her to trust anyone. A thousand miles away, she's fashioned a new life in a safe haven. Her brawny neighbor Richard and his engaging son Derreck would do anything to help her, but she keeps her past a secret until two of Tony's goons kidnap her in broad daylight. The race is on, and Marilee's life hangs in the balance! 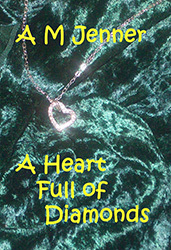 A Heart Full of Diamonds is available in print here, and in ebook at Amazon, Barnes & Noble, and Smashwords. In other news, the renovations have been finished on the older books. Clues to Food and Fabric of the World have new covers and lower prices. Due to requests from blog readers, I'm working on preparing Assignment to Earth and Inherit my Heart for publication in print and ebook. I'm also putting together a short story collection and a sampler book, which should be out shortly. I expect that The Siege of Kwennjurat will be coming out sometime this winter. It needed more work than I had time to complete during summer break. School starts again in two weeks and I've got a very full schedule this fall, so if you think I've dropped off the face of the planet, you'll know where I am. In the mean time, I can promise there will be a new blog post every Tuesday on something related to writing.